Today marks 100 days since Al Jazeera correspondent Peter Greste and his colleagues Mohamed Fahmy and Baher Mohamed were arrested on trumped up charges in Egypt. The treatment of journalists by the increasingly repressive Egyptian government is appalling and should be a source of shame for the country. Despite some more conciliatory statements in recent weeks by the interim President, Al Jazeera’s staff remain on trial for nothing more than doing their jobs – trying to provide balanced coverage of developments in Egypt during a period of political instability. The treatment of the journalists has prompted diplomatic interventions around the world, but and an effective social media campaign by fellow journalists in support of Peter, Mohamed and Baher. According to Al Jazeera more than 40,000 people in 30 countries have taken part in events to free the journalists, and #freeajstaff has had more than 800 million impressions on Twitter. The haunting black and white images of journalists with gags over their mouths have been particularly effective. How much impact this is having with Egypt’s judiciary is hard to tell, but the political class is certainly starting to show some nervousness at the damage to the country’s reputation. 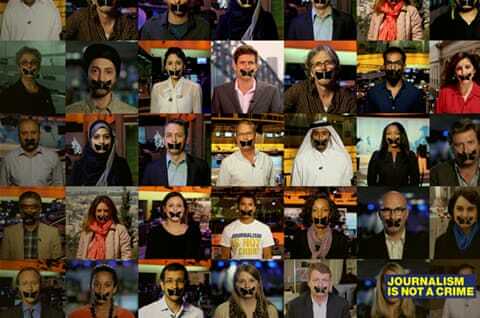 Let’s keep the pressure on and #freeajstaff.